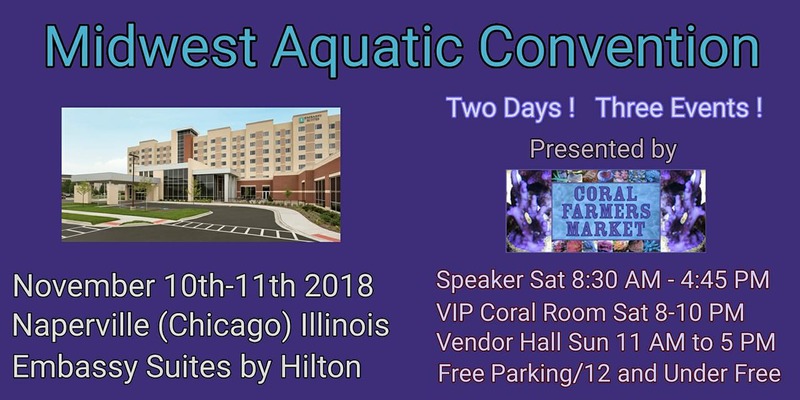 Everybody is invited to the MIDWEST AQUATIC CONVENTION 2-Day Expo & Frag Swap (Chicago, Illinois) Sponsored by the Coral Farmers Market. 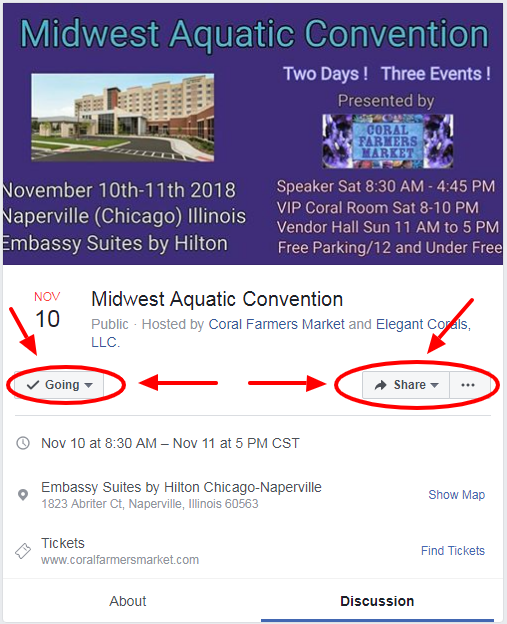 EVERYONE Please Remember to Mark "Going" or "Interested" on the MIDWEST AQUATIC CONVENTION 2-Day Expo & Frag Swap (Chicago, Illinois) Facebook Event Page. This 2-Day Event is Going to Be Awesome !!!! 3. Doors Open at 8:30 AM and the Event Ends at 4:45 PM on Saturday to see the Speakers. Doors Open at 11:00 AM and the Event Ends at 5:00 PM on Sunday to buy Coral. 4. Admission is $5 and Kids 12 and Under are FREE on Sunday to buy Coral. Admission is $35 and Kids 12 and Under are FREE on Saturday to see the Speakers. 6. Please Be Aware of How Much Time You Take Talking to a Vendor if what Your Discussing Doesn't Involve Buying Something. Vendors are Very Helpful and Knowledgeable and Most Will Try to Help You, but Please be Conscious of the Fact that Vendors are There to Sell and Not to Explain How to Rid Your Tank of Nuisance Algae (For Example). The MIDWEST AQUATIC CONVENTION 2-Day Expo & Frag Swap (Chicago, Illinois) is just 1 Week Away !!!!!!!! The MIDWEST AQUATIC CONVENTION 2-Day Expo & Frag Swap (Chicago, Illinois) is just 5 Days Away !!!!!!!! The MIDWEST AQUATIC CONVENTION 2-Day Expo & Frag Swap (Chicago, Illinois) is just 2 Days Away !!!!!!!! Had a Great Time at the MIDWEST AQUATIC CONVENTION 2-Day Expo & Frag Swap !!!! Big Thanks to Steve Tyree for Hosting the Show and Everyone that Helped Out.